As a parent, I sometimes have to buy kid’s outdoor clothes. Given I live in Finland where we get a lot of dark in the wintertime, getting gear with high quality reflectors is crucial from safety perspective. One thing I’ve learned over the years is, some reflectors are useless, while a good one can be seen far, far away. But how to tell them apart easily? Here’s a trick! Take a photo of the clothing piece with your camera phone with flash enabled. You’ll see in the resulting photo how much light is being reflected back. If the reflection isn’t super bright, the reflector is definitely not good. 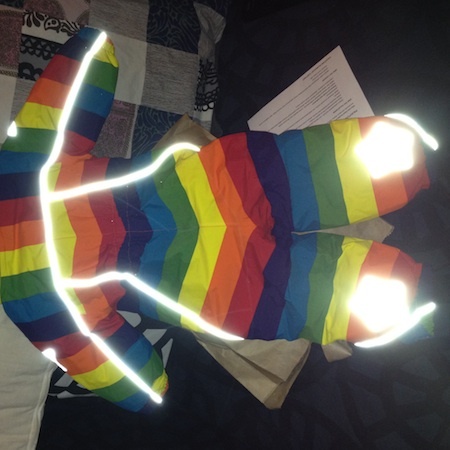 See below for what a good reflector design and material looks on a baby outdoor suit. Kudos to Molo Kids for the excellent design on the Polaris gear. This entry was posted in Parenthood hacks on January 29, 2012 by Sulka.